For progressives and activists in Bay Ridge, Dyker Heights, and beyond, our local Community Board is an often overlooked vestige of community empowerment that is crying out for more engagement. In our wonkiest episode yet, we’ll introduce our local Community Board Ten and explore it from all sides. We’ll hear from political aides, long-time board members, and activists. Along the way, we’ll dive into the strange, bureaucratic history of the boards and help explain why they function the way they do. There are many ways to get involved! For the brave, you can apply to be on the board (applications are due February 15th! ), attend local committee meetings, and represent your local civic or activist groups at public meeting sessions. So get a taste of what’s involved by listening in to our brand-new episode! The applications for CB10 are on the Brooklyn Borough Presidents website. Remember, everyone, the deadline is February 15th! And if you apply, be sure to Tweet to us at @RadioFreeBR or tell us on Facebook so we can get a really non-scientific count going! 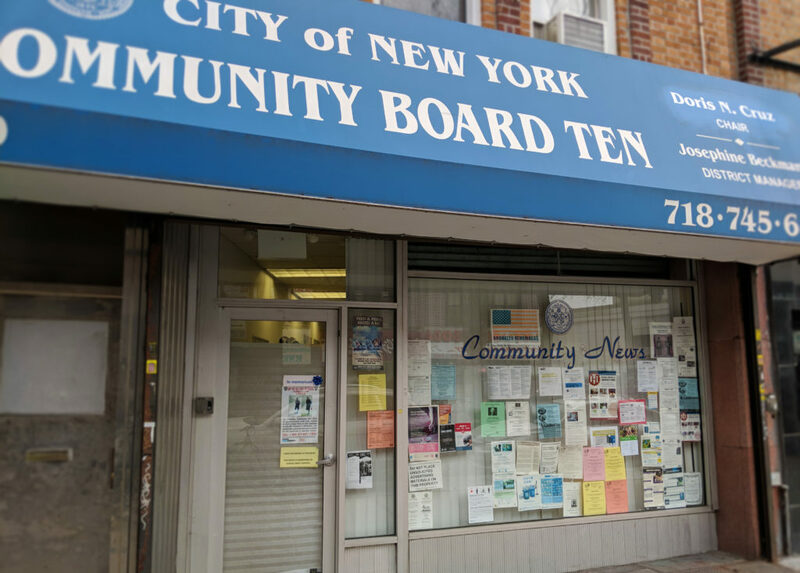 You can watch the last live-streamed Community Board 10 meeting on YouTube. It’ll give you a great idea of what a general meeting looks like… but remember, the real fun stuff all happens in the committee meetings! And as always, keep checking the CB10 Meetings Calendar to see what Committee Meetings you might want to attend. Like Joanne said, it’s open for everyone to attend! You can check out the early City Planning District layouts and statistics in this archived document from Archive.org. The layouts for CB10 didn’t change that much from the original district boundaries… but other neighborhoods, especially ethnic or immigrant communities, were explicitly gerrymandered. The 1980’s stats Dan references are from two books, Robert Pecorella’s ‘Community Power in a Postreform City: Politics in New York City‘ and John Mudd’s ‘Neighborhood Services: Making Big Cities Work‘. These two books served as the primary sources for most of the historical data outlined in the show. Another interesting stat from Pecorella’s book involved Community Board representation, based on a survey of existing board members across the city at the time: “Most respondents were Middle Class. 20% businesspeople, 16% govt workers, 13% professional, 12% nonprofit. Almost 70% were also involved in other civic associations, 30% were in local political clubs, 20% were in development corps. More than 50% were long-term (10+ year) residents.” It would be very interesting to see if these stats have changed. Previous Previous post: Congressional Contenders: Michael DeVito Jr.